Static Timing Analysis - what does it mean when a design fails timing? VHDL is a compound acronym for VHSIC (Very High Speed Integrated Circuit) HDL (Hardware Description Language). As a Hardware Description Language, it is primarily used to describe or model circuits. VHDL is an ideal language for describing circuits since it offers language constructs that easily describe both concurrent and sequential behavior along with an execution model that removes ambiguity introduced when modeling concurrent behavior. VHDL is typically interpreted in two different contexts: for simulation and for synthesis. When interpreted for synthesis, code is converted (synthesized) to the equivalent hardware elements that are modeled. Only a subset of the VHDL is typically available for use during synthesis, and supported language constructs are not standardized; it is a function of the synthesis engine used and the target hardware device. When VHDL is interpreted for simulation, all language constructs are available for modeling the behavior of hardware. Declares signals corresponding to the input and output ports of the DUT. Instantiates the DUT and connects its ports to the declared signals. Instantiates the processes that drive the signals connected to the input ports of the DUT. Ideally, a simulation environment should be usable as a robust non-regression test, that is, it should automatically detect violations of the DUT specifications, report useful error messages and guarantee a reasonable coverage of the DUT functionalities. When such simulation environments are available they can be rerun on every change of the DUT to check that it is still functionally correct, without the need of tedious and error prone visual inspections of simulation traces. In practice, designing ideal or even just good simulation environments is challenging. It is frequently as, or even more, difficult than designing the DUT itself. In this example we present a simulation environment for the Synchronous counter example. We show how to run it using GHDL and Modelsim and how to observe graphical waveforms using GTKWave with GHDL and the built-in waveform viewer with Modelsim. We then discuss an interesting aspect of simulations: how to stop them? -- the corresponding port but they do not need to. -- being an infinite loop, the clock will never stop toggling. -- simulation until the 5th rising edge of the clock. wait; -- Eternal wait. Stops the process forever. counter_sim.vhd:50:35: no declaration for "rising_edge"
The GHDL analyzer discovered that our design instantiates an entity named counter but this entity was not found in library work . This is because we did not compile counter before counter_sim . When compiling VHDL designs that instantiate entities, the bottom levels must always be compiled before the top levels (hierarchical designs can also be compiled top-down but only if they instantiate component , not entities). The rising_edge function used by our design is not defined. This is due to the fact that this function was introduced in VHDL 2008 and we did not tell GHDL to use this version of the language (by default it uses VHDL 1993 with tolerance of VHDL 1987 syntax). Note that the --std=08 option is needed for analysis and simulation. Note also that we launched the simulation on entity counter_sim , architecture sim , not on a source file. where we can see that the counter works as expected. Note the -voptargs="+acc" option passed to vsim : it prevents the simulator from optimizing out the data signal and allows us to see it on the waveforms. Note that we re-compiled only the simulation environment: it is the only design that changed and it is the top level. Had we modified only counter.vhd , we would have had to re-compile both: counter.vhd because it changed and counter_sim.vhd because it depends on counter.vhd . A VHDL program can be simulated or synthesized. Simulation is what resembles most the execution in other programming languages. 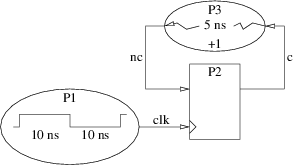 Synthesis translates a VHDL program into a network of logic gates. Many VHDL simulation and synthesis tools are parts of commercial Electronic Design Automation (EDA) suites. They frequently also handle other Hardware Description Languages (HDL), like Verilog, SystemVerilog or SystemC. Some free and open source applications exist. GHDL is probably the most mature free and open source VHDL simulator. It comes in three different flavours depending on the backend used: gcc , llvm or mcode . The following examples show how to use GHDL (mcode version) and Modelsim, the commercial HDL simulator by Mentor Graphics, under a GNU/Linux operating system. Things would be very similar with other tools and other operating systems. The statement will be executed at the beginning of the simulation and print the Hello world! message on the standard output. The simulation will then end because there is nothing more to be done. The VHDL source file we wrote contains two compilation units. We could have separated them in two different files but we could not have split any of them in different files: a compilation unit must be entirely contained in one source file. Note that this architecture cannot be synthesized because it does not describe a function which can be directly translated to logic gates. The gh_work directory is where GHDL stores the files it generates. This is what the --workdir=gh_work option says. The analysis phase checks the syntax correctness and produces a text file describing the compilation units found in the source file. The run phase actually compiles, links and executes the program. Note that, in the mcode version of GHDL, no binary files are generated. The program is recompiled each time we simulate it. The gcc or llvm versions behave differently. Note also that ghdl -r does not take the name of a VHDL source file, like ghdl -a does, but the name of a compilation unit. In our case we pass it the name of the entity . As it has only one architecture associated, there is no need to specify which one to simulate. # ** Note: Hello world! vlib , vmap , vcom and vsim are four commands that Modelsim provides. vlib creates a directory (ms_work ) where the generated files will be stored. vmap associates a directory created by vlib with a logical name (work ). vcom compiles a VHDL source file and, by default, stores the result in the directory associated to the work logical name. Finally, vsim simulates the program and produces the same kind of output as GHDL. Note again that what vsim asks for is not a source file but the name of an already compiled compilation unit. The -c option tells the simulator to run in command line mode instead of the default Graphical User Interface (GUI) mode. The -do option is used to pass a TCL script to execute after loading the design. TCL is a scripting language very frequently used in EDA tools. The value of the -do option can be the name of a file or, like in our example, a string of TCL commands. run -all; quit instruct the simulator to run the simulation until it naturally ends - or forever if it lasts forever - and then to quit. This example deals with one of the most fundamental aspects of the VHDL language: the simulation semantics. It is intended for VHDL beginners and presents a simplified view where many details have been omitted (postponed processes, VHDL Procedural Interface, shared variables...) Readers interested in the real complete semantics shall refer to the Language Reference Manual (LRM). VHDL also uses variables and they have exactly the same role as in most imperative languages. But VHDL also offers another kind of value container: the signal. Signals also store values, can also be assigned and read. The type of values that can be stored in signals is (almost) the same as in variables. So, why having two kinds of value containers? The answer to this question is essential and at the heart of the language. Understanding the difference between variables and signals is the very first thing to do before trying to program anything in VHDL. Let us illustrate this difference on a concrete example: the swapping. Note: all the following code snippets are parts of processes. We will see later what processes are. with the same result and without the need of a third temporary signal! Note: the VHDL signal assignment operator <= is different from the variable assignment operator := . If we execute this step by step in a debugger we can see the value of a changing from the initial 15 to 30, 25 and finally 5. If we execute this step by step in a debugger we will not see any value change of s until after the wait instruction. Moreover, the final value of s will not be 15, 30, 25 or 5 but 3! This apparently strange behavior is due the fundamentally parallel nature of digital hardware, as we will see in the following sections. The processes, just like the hardware they are modelling, never end: they are infinite loops. After executing the last instruction, the execution continues with the first. As with any programming language that supports one form or another of parallelism, a scheduler is responsible for deciding which process to execute (and when) during a VHDL simulation. Moreover, the language offers specific constructs for inter-process communication and synchronization. The scheduler maintains a list of all processes and, for each of them, records its current state which can be running , run-able or suspended . There is at most one process in running state: the one that is currently executed. As long as the currently running process does not execute a wait instruction, it continues running and prevents any other process from being executed. The VHDL scheduler is not preemptive: it is each process responsibility to suspend itself and let other processes run. This is one of the problems that VHDL beginners frequently encounter: the free running process. Note: variable a is declared locally while signals s and r are declared elsewhere, at a higher level. VHDL variables are local to the process that declares them and cannot be seen by other processes. Another process could also declare a variable named a , it would not be the same variable as the one of process P3 . As soon as the scheduler will resume the P3 process, the simulation will get stuck, the simulation current time will not progress anymore and the only way to stop this will be to kill or interrupt the simulation. The reason is that P3 has not wait statement and will thus stay in running state forever, looping over its 3 instructions. No other process will ever be given a chance to run, even if it is run-able . Note: the VHDL equality operator is = . If process P4 is resumed while the value of signal s is 3, it will run forever because the a = 16 condition will never be true. means suspend me until the value of signal s changes. This condition is recorded by the scheduler. The scheduler then selects another process among the run-able , puts it in running state and executes it. And the same repeats until all run-able processes have been executed and suspended. Important note: when several processes are run-able , the VHDL standard does not specify how the scheduler shall select which one to run. A consequence is that, depending on the simulator, the simulator's version, the operating system, or anything else, two simulations of the same VHDL model could, at one point, make different choices and select a different process to execute. If this choice had an impact on the simulation results, we could say that VHDL is non-deterministic. As non-determinism is usually undesirable, it would be the responsibility of the programmers to avoid non-deterministic situations. Fortunately, VHDL takes care of this and this is where signals enter the picture. Note: VHDL comments extend from -- to the end of the line. Every time a signal is assigned, the assigned value is recorded by the scheduler but the current value of the signal remains unchanged. This is another major difference with variables that take their new value immediately after being assigned. Let us look at an execution of process P5 above and assume that a=5 , s=1 and r=0 when it is resumed by the scheduler. After executing instruction a := s + 1; , the value of variable a changes and becomes 2 (1+1). When executing the next instruction r <= a; it is the new value of a (2) that is assigned to r . But r being a signal, the current value of r is still 0. So, when executing a := r + 1; , variable a takes (immediately) value 1 (0+1), not 3 (2+1) as the intuition would say. When will signal r really take its new value? When the scheduler will have executed all run-able processes and they will all be suspended. This is also referred to as: after one delta cycle. It is only then that the scheduler will look at all the values that have been assigned to signals and actually update the values of the signals. A VHDL simulation is an alternation of execution phases and signal update phases. During execution phases, the value of the signals is frozen. Symbolically, we say that between an execution phase and the following signal update phase a delta of time elapsed. This is not real time. A delta cycle has no physical duration. As we can see, after the execution of our two processes, the result is the same whatever the order of execution. Note: the same signal can be assigned several times during the same execution phase. In this case, it is the last assignment that decides the next value of the signal. The other assignments have no effect at all, just like if they never had been executed. the two first assignments of signal s have no effect, why s is finally assigned 3 and why the two printed values are 15 and 3. In process P1 the wait instruction is not used to wait until the value of a signal changes, like we saw up to now, but to wait for a given duration. This process models a clock generator. Signal clk is the clock of our system, it is periodic with period 20 ns (50 MHz) and has duty cycle. Process P2 models a register that, if a rising edge of clk just occurred, assigns the value of its input nc to its output c and then waits for the next value change of clk . With the introduction of the physical time, and knowing that we also have a symbolic time measured in delta, we now have a two dimensional time that we will denote T+D where T is a physical time measured in nano-seconds and D a number of deltas (with no physical duration). There is one important aspect of the VHDL simulation that we did not discuss yet: after an execution phase all processes are in suspended state. We informally stated that the scheduler then updates the values of the signals that have been assigned. But, in our example of a synchronous counter, shall it update signals clk , c and nc at the same time? What about the physical delays? And what happens next with all processes in suspended state and none in run-able state? Execute each process until it suspends on a wait statement. Record the values and delays of signal assignments. Record the conditions for the process to resume (delay or signal change). The resume time of processes suspended by a wait for <delay> . The next time at which a signal value shall change. Update signals that need to be. Put in run-able state all processes that were waiting for a value change of one of the signals that has been updated. Put in run-able state all processes that were suspended by a wait for <delay> statement and for which the resume time is Tc . Execute all run-able processes until they suspend. If Tn is infinity, stop simulation. Else, start a new simulation cycle. To conclude, let us now manually exercise the simplified simulation algorithm on the synchronous counter presented above. We arbitrary decide that, when several processes are run-able, the order will be P3 >P2 >P1 . The following tables represent the evolution of the state of the system during the initialization and the first simulation cycles. Each signal has its own column in which the current value is indicated. When a signal assignment is executed, the scheduled value is appended to the current value, e.g. a/b@T+D if the current value is a and the next value will be b at time T+D (physical time plus delta cycles). The 3 last columns indicate the condition to resume the suspended processes (name of signals that must change or time at which the process shall resume). Note: during the first simulation cycle there is no execution phase because none of our 3 processes has its resume condition satisfied. P2 is waiting for a value change of clk and there has been a transaction on clk , but as the old and new values are the same, this is not a value change. Note: again, there is no execution phase. nc changed but no process is waiting on nc . Note: one could think that the nc update would be scheduled at 15+2 , while we scheduled it at 15+0 . When adding a non-zero physical delay (here 5 ns ) to a current time (10+2 ), the delta cycles vanish. Indeed, delta cycles are useful only to distinguish different simulation times T+0 , T+1 ... with the same physical time T . As soon as the physical time changes, the delta cycles can be reset. -- values: '0' and '1'. It is one of the standard types. -- type. VHDL is not case sensitive. -- A process is a concurrent statement. It is an infinite loop. -- until clock changes and its new value is '1' (a rising edge). -- <= is the signal assignment operator. -- in the same process.